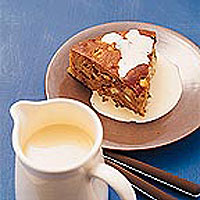 The perfect winter's dessert - traditional apple sponge pudding served with a creamy whisky sauce. Line the base of a 20cm loose-bottomed cake tin with greaseproof paper or baking parchment. With an electric beater cream the butter and sugar together until smooth. Slowly whisk in the eggs followed by the milk. Mix the flour with the cinnamon and fold into the egg mixture. Add the diced apple and pecans and spoon the mixture into the prepared tin. Place in a pre-heated oven 180ºC, gas mark 4 for 55 minutes or until a skewer inserted into the centre comes out clean. Leave to cool in the tin for 20 minutes, then turn out and serve warm with the whisky sauce. For the sauce, bring the cream to the boil, then turn down the heat and stir in the maple syrup and whisky. Serve immediately. Instead of whisky sauce, serve the pudding with ice cream and a spoonful of Merchant Gourmet Dulce de Lèche.